BENEATH: Sea Monsters And Social Darwinism – Schlockmania! Over the last few decades, Larry Fessenden has built a strong cult reputation as an independent filmmaker with a unique, personalized take on the horror genre. Whether he is directing his own work or producing for others through his company Glass Eye Pix, he shows dedication to challenging the expectations of the horror audience. 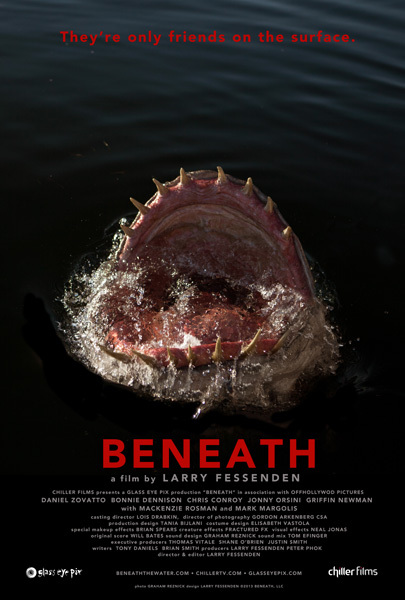 Beneath is his most recent directorial work as of this writing and it shows a fierce intelligence that will take those expecting the usual low budget horror tropes by surprise. You could be excused for mistaking Beneath for the usual horror programmer due to its traditional setup. It begins with a sextet of recent high school graduates venturing out to a secluded lake to celebrate their freedom from school. 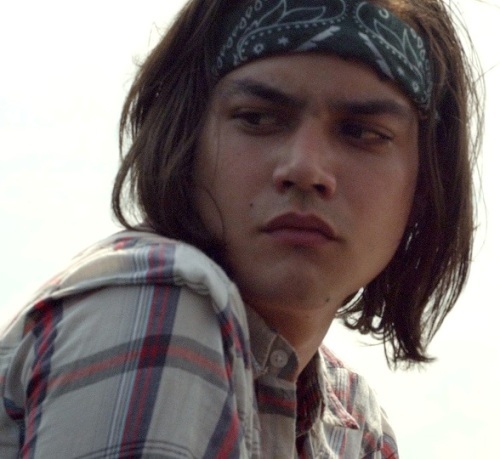 Johnny (Daniel Zovatto) has put the trip together and his plan is to simply take a rowboat across the lake to a private campground. However, that plan changes when alpha male Matt (Chris Conroy) decides to take a long swim with his queen bee girlfriend Kitty (Bonnie Dennison) and her pal Deb (Mackenzie Rosman). 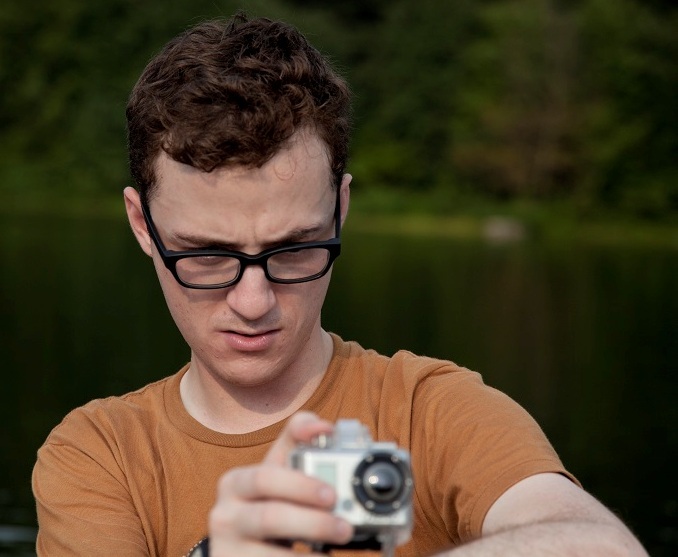 Johnny is left on the boat with film-geek motormouth Zeke (Griffin Newman) and Matt’s second-banana little bro Simon (Jonny Orsini). A large, seemingly prehistoric fish emerges from the depths and begins to menace the partiers. As the danger sets in, they are forced to make some hard decisions and the unspoken tension of their relationships surfaces in unexpected and brutal ways. Beneath reveals itself to be a bracing alternative after its traditional opening half-hour. Without lessening the danger the killer fish presents, the script by Tony Daniel and Brian Smith allow it to become a catalyst to some vicious displays of social Darwinism amongst the friends that are scarier than any aquatic threat could be. There’s a pleasantly surprising unpredictability to the dynamic these characters share, which constantly shifts as the group’s numbers dwindle: each character gets the chance to be both tormentor and victim as alliances fracture and reshape around them. You’ll be surprised by who lives and who dies – and the storyline also boasts a darkly humorous ending that doesn’t cop out on the story’s dark “high school as societal microcosm” world view. Fessenden directs the slow-burn mayhem with a style that is unexpectedly lyrical, using the natural beauty of the lakeside setting as an ironic backdrop to the cruelty that erupts from the characters’ interactions. Gordon Arkenberg’s lush photography plays a big role in creating that lovely/brutal dichotomy and Will Bates provides a score that is hypnotic without lapsing into horror-music cliches. The sound design by Graham Reznick seals the atmosphere, lending a subtle creepiness to the film’s overall vibe. Fessenden also does well with his actors, all of whom offer vivid turns: Conroy is memorable as the alpha type who comes to regret his tough-guy ways while Dennison creates a believably queasy portrait of someone who doesn’t like having to pay the price for manipulation. Orsini registers strongly as the second banana who thrives on getting to put others down while Zovatto supplies an x-factor as the member of the group who has secret knowledge of what is going on. There is also a nice brief role by character actor vet Mark Margolis, playing a sinister local who knows a thing or two about the lake’s secrets. That said, the scene-stealer of the piece is Newman, who turns what could have been another comic-relief character into a memorable portrait of scheming and desperation. As the danger kicks in, his sarcasm quickly reveals itself to be a Trojan horse for the darkest, most Darwinian mindset of the group. In short, Beneath isn’t just another teen-kill horror flick. It has the daring to supplement the expected thrills with a darker theme that suggests that no matter what threat they have to deal with, the human race will always be its own worst enemy. That’s pretty heady stuff for a low-budget horror flick and Fessenden’s commitment to seeing it through really sets Beneath apart from its competition.